This card is in NM/M condition. Shipping on this item will be $3. All cards purchased in a 3 day period will be combined for no additional shipping charge. Please use the shopping cart feature to take advantage of combined shipping. If you are overcharged let us know we will refund as soon as possible. Thank you for looking and please check out all my other great items on eBay. 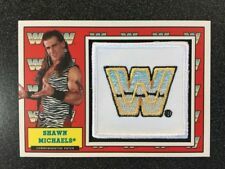 2017 Topps WWE/LEGENDS~ Shawn Michaels (#8/50)~(HBK) AUTO RELIC CARD!!! (AR-SM). Condition is Brand New. Shipped with USPS First Class Package. Free combined shipping! 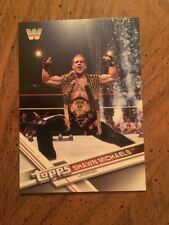 2017 Sports Heroes Metal Shawn Michaels HBK Printing Plate Auto 1/1! CARD IS IN NM OR BETTER CONDITION. Very cool. Check out our other items for more great deals ! 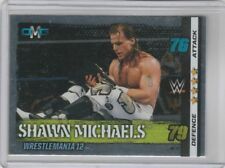 DREAM MATCHES SILVER PARALLEL CARD. App to receive this item. A: I use a top loader for all orders to keep the cards safe. Q: Why is there a limit to the number of cards allowed per envelope?. Q: I only received part of my order, where is the rest?. Austra lia 3-4 weeks. Serial Numbered 24 of 99. DREAM MATCHES BRONZE PARALLEL CARD. (up to 500 cards). A: I use a top loader for all orders to keep the cards safe. Q: Why is there a limit to the number of cards allowed per envelope?. Q: I only received part of my order, where is the rest?. You must have the WWE Slam Card Trader app to receive this item. App to receive this item. If buying more than 3 cards, there will be more than one envelope. Q: I only received part of my order, where is the rest?. Austra lia 3-4 weeks. Canada 2-3 weeks. If buying more than 3 cards, there will be more than one envelope. (up to 500 cards). Card conditions are based on my quick glance and could be off slightly. I go thru thousands of cards every week and it's just impossible to check the condition of each card thoroughly. NO EXCEPTIONS. Rates are as follows;. NO E-CHECKS! Year: 2017. Item Condition: Near Mint/Mint. SetType: Parallel Insert. Attributes: Serial Numbered. Sport: Wrestling. WRESTLING TRADING CARD SHOWN IN THE PHOTO. by the trading card manufacturer. Card is in Near Mint Condition. Be sure to add us to yourfavorites list ! 100% CERTIFIED AUTHENTIC. (Does not contain a single noticeable flaw that we can find.). Serial Numbered 22 of 50. Year: 2017. Sorry, no exceptions! Sport: Wrestling. USA Orders (Including Hawaii, Alaska, Puerto Rico & all US Territories). Card is in Near Mint Condition. (Does not contain a single noticeable flaw that we can find.). Be sure to add us to yourfavorites list ! 100% CERTIFIED AUTHENTIC. WRESTLING TRADING CARD SHOWN IN THE PHOTO. Year: 2017. Sport: Wrestling. Item#: 195. Sorry, no exceptions! .